TREASONABLE FELONY CHARGE ON KANU... A MOCKERY TO NIGERIA CONSTITUTION AND A SLAP ON UNITED NATIONS CHARTER ON THE RIGHT OF INDIGENOUS PEOPLE. 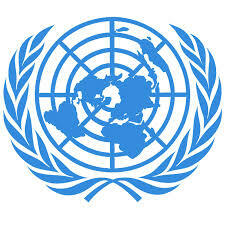 Self-determination is recognized as a right of Indigenous Peoples in the Declaration on the Rights of Indigenous Peoples (DRIP), adopted by the United Nations General Assembly in 2007. Based on the above charter, President Mohammadu Buhari moved a motion on the floor of the United Nations 70th General Assembly in September 2015 in the United States of America to demand for Independence of State of Palestine, but cannot implement same in his own country. This is sheer hypocrisy. Biafrans are resolute and will stop at nothing to to bring about the implementation of the United Nations Charter on the rights of the Indigenous people. Nnamdi Kanu is the man championing the curse of the self-determination of the Indigenous People of Biafra (IPOB) and he is championing this course in line with Article 3,4 and 5 of the United nations charter. I am yet to fathom how Nigerian government sees pursuance of self-determination by Nnamdi Kanu and the Indigenous People of Biafra (IPOB) as treason. Monkeys and Baboons don't reason like humans. They don't know about the rule of law or constitution and have no regard for it. I must state here categorically that Nigeria government under president Muhamadu Buhari is making mockery of the declaration of the right of indigenous people enshrined in the United nations charter, after indirectly declaring the position of the judiciary irrelevant by blatantly flouting the order of the court three consecutive times on the unconditional release of Nnamdi Kanu, and still held him hostage in the DSS prison. Charging Nnamdi Kanu and other members of IPOB for treasonable felony is laughable and baseless because Nnamdi Kanu and the Indigenous People of Biafra (IPOB) are freedom fighters seeking for self-determination in line with the United Nations charter. The United Nations Charter on the rights of Indigenous people makes no meaning to Buhari as far as Biafrans are concerned but means a lot when it comes to the Independence of the state of Palestine. 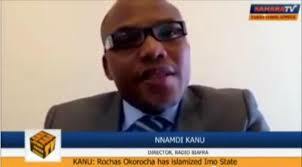 Nnamdi Kanu, the leader of the Indigenous People of Biafra, Director of radio Biafra and Biafra TV is a human right activist, he only seek the freedom of his people as it is provided by international law. I will advice that Nnamdi Kanu should released unconditionally as ruled by the high court in Abuja, including all citizens of Biafra held in Nigeria open and secret cell, to avert the doom ahead. Indigenous People of Biafra are peace loving people and would prefer that Nigeria government tow the line of peaceful resolution of this matter than allowing the innocent people of Biafra and Nigeria to suffer the foolishness of few people in the government. Pmb is an illiterate but d worst is dt he pick up dead wood like daura into his govt, hence they will drive him 2 d woods. APC is a political party under which pmb is ruling. Where are they in d present confusion pmb/daura is causing. Am yet to hear from amed tinubu who in search of power moved nigeria 2 dark ages where court orders are meningless but same people want 2 persecute/prosecute people. APC is a dead Party led by ghosts! 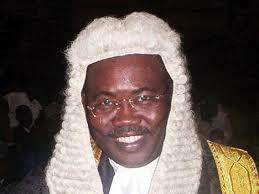 It is my candid opinion that the motion for the independence of Biafra be properly moved in a constitutional way. Rather resorting to insulting the government of Nigeria, Things should be done in a respectful manner to earn the respect of others. Men agitated for the independence of Nigeria and moved the motion in a constituted assembly and it was granted. I want Biafra to take the same legal steps. This is my own opinion. If Enahoro was not charged for treasonable felony, I don't think anyone who moved such motion is guilty of such offence. Dress, they say, in the way you wished to be addressed. Did you read what that charter said? Did it said it must be through motion in the national assembly? In a situation where you don't have equal representatives in the house hence the the calculated plan right from 1960 to deny a people their economic,cultural,religious,and political way of life,what will they do to have their freedom? Stop being a conny man in truth for when it sparks off no one will remain.